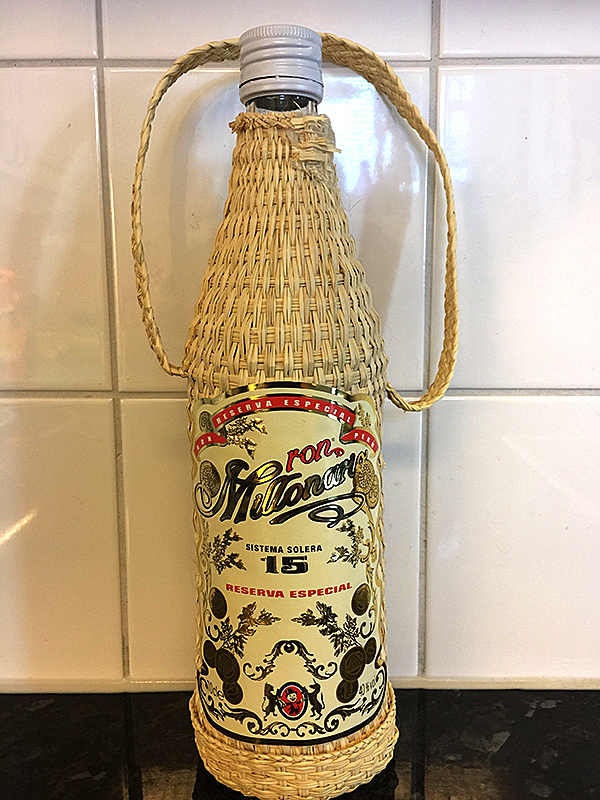 Have you found an online vendor selling Ron Millonario Reserva Especial 15? Ron Millonario Reserva Especial 15 rum is created from molasses using a 1930's Scottish column still and aged in American and Slavonian oak casks up to 15 years using the solera blending method. The Ron Millonario company was founded in 1950, and in 2004 was purchased by the Italian Fabio Rossi. This rum has never let me down though it's way to sweet, but always brings a smile to my face. Brown sugar caracter and a smoothe spicy finish that evens out the sweetness very nicely. Highly recomended to "first timers" as well. The Ron Millonario Reserva Especial 15 comes in a nice and a bit retro grass cover. My bottle was hard to open so I ruined the grass top (picture). I would prefer another presentation. The Ron Millonario Reserva Especial 15 has a dark colour and on the nose you get spice, oak and sweet aromas of toffee and vanilla. I f you let the rum rest in the glass for a few minutes the aromas gets smoother and you don´t sense any sticky alcohol. The Ron Millonario Reserva Especial 15 tastes sweet toffee and you also taste some fruit, spice and almonds. A lot of different flavours. In the throat this rum is very smooth with some spice and the aftertaste is quite short with some oak, sweetness and spices. You can drink this rum neat as a sipper but also as a base in cocktails and drinks. A great starter rum for anyone who wants to start a "rumjourney". A very good and price worthy rum but personally I prefer the smoother big brother Ron Millonario XO as a sipper. Dont like grass cover so much, but inside is great. Similar like his older brother XO, which is only a bit deeper and smoother... and much more expensive. This ron is very sweet (for me it's the limit). In the mounth after the sweet taste, we have vanilla, caramel. The bottle is original. I really like this rum! In fact, it is so good, I was curious to see how it compares to the Millonario XO, so I tried them side be side. They were surprisingly close! Ultimately, the Millonario XO is the better rum, but not by much at all. I rate them nearly the same. Smells and tastes of a nice peppery spice with a nice sweetness to it. Also includes toffee and cinnamon. Very easy drinking and very good! Tried this at a rum festival and ended up buying a bottle. It's certainly not my favorite for sipping, and haven't found an amazing cocktail for it yet. Dégusté après un Centenario 20, ce rhum péruvien est plus sec. Le premier nez est alcoolisé, mais il disparaît rapidement au profit de la vanille. La bouche reste plus sèche, avec des notes de caramel bien marquées. Il est plaisant mais enveloppe moins le palais que d'autres rhums de la même catégorie. Den mest let drikkelige rom jeg har smagt, ingen alkohol burn, kun varme og sødme, med en super behagelig og lang eftersmag. Der Millonario 15 kommt nicht nur optisch auffallend daher sonder auch geschmacklich ein sehr guter Rum. Der Millonario XO ist für mich nochmal eine Stuffe höher und ein tick besser in Balance. rhum très plaisant et gourmand mais reste sec,alcoolisé, et vanillé. Havde nok forventet noget mere. Den er ok, men heller ikke mere, sød, krydret. Farin, chokolade, tørrede frugter, sød og krydret, en rigtig lækker rom. Aroma is moderate with notes of carpentry workshop, varnish. Taste is sweet, dessert, spicy, soft with light tart oak notes. taste: Sugar, very sweet!, licorice also in mouth.. Dangerous, it let itself drink very easily, almost more a liquor than a rum, on the other hand, you quickly get bored of the taste..